Two ships collide. Or the ground shakes. If there’s an emergency at the Port of Long Beach, response teams first need to know what and where it is. Thanks to the Virtual Port Project, that information and much more will soon be at the fingertips of the Port of Long Beach’s security team and partner agencies. The system integrates information from more than 50 data sources into comprehensive real-time images the agencies can access simultaneously to coordinate and deploy response teams, tackle the problem and restore port operations faster and more efficiently than ever before. 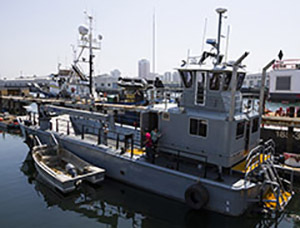 A refurbished U.S. Army craft that strengthens the Port of Long Beach’s search, salvage and rescue capabilities has joined the Port’s fleet of security vessels. Officials recently welcomed the Sea Force, a Landing Craft Mechanized Mark 8, or LCM-8, donated by the U.S Defense Logistics Agency and renovated with funding from the California Port and Maritime Security Grant Program. Long Beach City College executive Lou Anne Bynum has been appointed to the Long Beach Board of Harbor Commissioners. Bynum, the Executive Vice President of College Advancement and Economic Development, attended her first regular meeting as a commissioner May 27. The appointment marks the first time in the Port’s 103-year history that women hold the majority of the seats on the five-member Board. A longstanding civic leader active in Long Beach business, education and community organizations, Bynum fills the remaining year of the unexpired term held by former Commissioner Thomas Fields. Employers who operate port terminals and shipping lines at 29 West Coast ports and the union representing nearly 20,000 workers who move the cargo have issued a joint statement saying “they expect cargo to keep moving until an agreement is reached.” The statement sets a positive tone for negotiations between the Pacific Maritime Association and the International Longshore and Warehouse Union for a new contract. The parties began talks May 12 and plan to meet daily to negotiate a new collective bargaining agreement. The current contract, a six-year agreement, expires June 30. Health care, retirement benefits and jurisdiction are expected to be key issues. Overall container cargo volume at the Port of Long Beach jumped 9.7 percent in April compared with activity for the same month last year. Imports surged 11.9 percent and exports climbed 6.3 percent. The increase in trade follows a slow first quarter attributed to the Lunar New Year, a holiday season during which many businesses in China and other East Asian countries close for two weeks, and harsh winter weather in much of the U.S. Midwest and East Coast. The Long Beach Port of Harbor Commissioners has named Neil Morrison as the Port’s Assistant Managing Director of Engineering Design and Maintenance. Morrison, a licensed professional engineer who joined the Port in 2009 as Director of Engineering Design, fills a new post created to oversee construction and maintenance of the Port’s terminals, roads, bridges and other infrastructure. Morrison has 35 years of experience as a civil engineer and executive, managing design and construction projects in the private and public sectors. The Port has honored seven vessel operators with its new Environmental Achievement Award, which recognizes shipping lines that participate in both the Port’s Green Flag and Green Ship programs. The honorees are: Hanjin Shipping Co. Ltd., Matson Navigation, “K” Line, Mitsui OSK, Mediterranean Shipping Co., Orient Overseas Container Line and Wallenius Wilhelmsen. 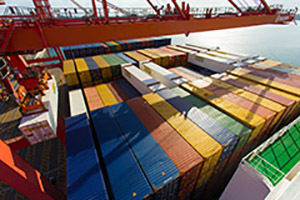 The Green Flag program offers a dockage incentive to ocean carriers to reduce vessel emissions by slowing their ships within 20 nautical miles of the Port, and another incentive for slowing within 40 miles. 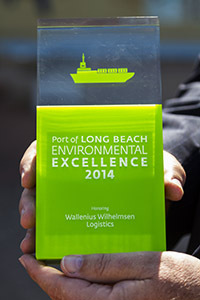 The Green Ship program also offers incentives to carriers that bring their cleanest ships to Long Beach. The two programs have helped the Port achieve dramatic reductions in air pollution. 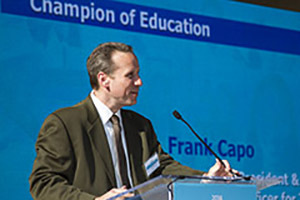 Frank Capo, former Senior Vice President and Chief Commercial Officer for Total Terminals International LLC, received the Port of Long Beach’s first Champion of Education Award for his longstanding support for Port programs educating local students about international trade. The award was given May 13 at a reception that also celebrated the Port’s 2014 scholarship recipients and high school summer interns. After 18 years in Southern California, Capo recently returned to his native New Jersey to work for Maher Terminals LLC where he started his career in the maritime industry. Capo’s new position is Senior Vice President, Commercial at Maher’s operations in Port Elizabeth. Two financial consultants have joined the Port of Long Beach while it conducts an executive search to fill top management positions in its Finance and Accounting Division. Chuck Adams, a former deputy director of administration for the Los Angeles County Department of Public Works, and Dan Miles, an accountant with more than 20 years of experience, will assist the Port during its search to fill vacancies recently created when former Chief Financial Officer Sam Joumblat and former Assistant Chief Financial Officer Thomas Franklin both left to work for Metrolink. PierPass Inc. is conducting a search for a new president as it prepares for a change in leadership in the coming year. Plans call for current President and CEO Bruce Wargo to replace Board Chairman Jon Hemingway, chairman of Carrix Inc., who has headed the board since PierPass was founded in 2004. Wargo will remain CEO when he becomes board chairman. PierPass runs the OffPeak program, created to reduce congestion and emissions and improve safety at the ports of Long Beach and Los Angeles.